The map is your primary source of intelligence when it comes to directions, elevations, coordinates, and the shape of the terrain. Wherever you might be operating, it is vital you have a grasp on how to bring up the map and GPS by using the keys: <M> or <CTRL+R> by default, respectively. Knowing how to read and interact with this basic tool, and not just looking at it, is compulsory to the success of you and your team. Depending on the game’s mission settings, the map also serves to update you (nearly real time) on the maneuvers of friendly and/or enemy forces. Elevation, or the height of the terrain, is designated by 4 tan-colored numbers. The elevation displayed will vary depending on the zoom of the map. With this in mind, it is important to zoom all amounts inside and outside of your AO so you do not miss any mission-critical land features. At the map’s center below, you will find the elevation of this mountain is 2624m, and that the landform gently slopes down to an elevation of 2609m to the Northeast. An example of topographical lines is above, and may be a feature you are already familiar with reading. These are the lines that flow across your map, molding themselves around mountains, and bringing the terrain to life with more than just trees, buildings, and roads. Topographical lines can be thought of as a 2D depiction of a 3D surface. For snipers, while it may seem second nature, the contour and cover of your Firing Position (FP) — particularly from your enemy’s perspective — should never be overlooked. Not knowing if there is a higher mountain in front of you will likely add more time to getting your team in position and on scope over your fire sector. 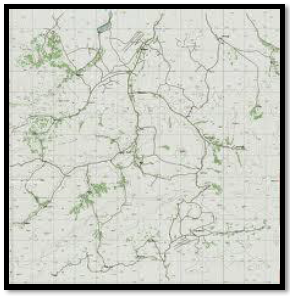 Reading the topographical lines on a map and the various terrain features they reveal will aid you in identifying a natural angle of approach your enemy is likely to use. 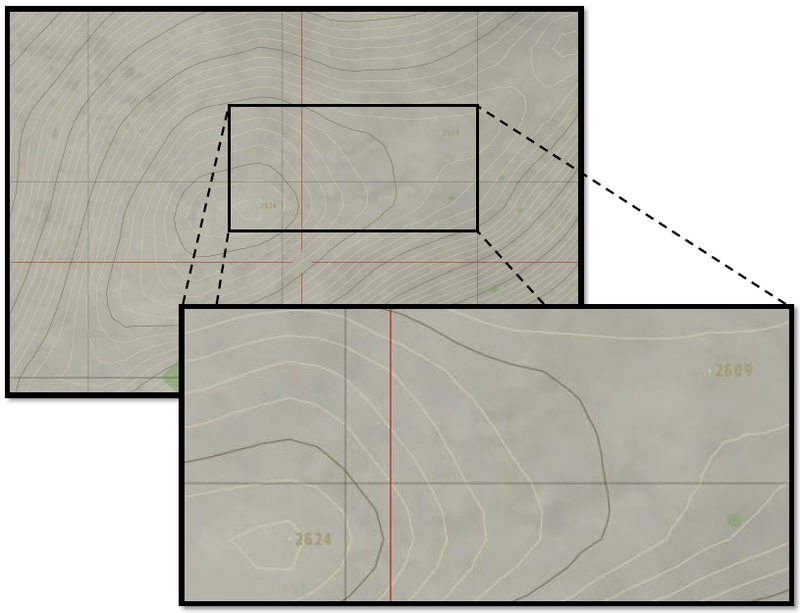 We go into more detail on symbols and terrain features as seen in Arma 2’s topography map of in a couple pages. Shown in the map above is an active AO, shaded in red. At the more functional levels of zoom, as you close in, fine grey lines will appear to form a grid. The distance of each grid box is 100m by 100m and approximately 141m diagonally. This grid distance can be utilized as a scale to measure your range to the AO. On the outside of the map are grey numbers. By using the standard X, Y convention (X axis number, then Y axis number), coordinates can locate each grid on the map. 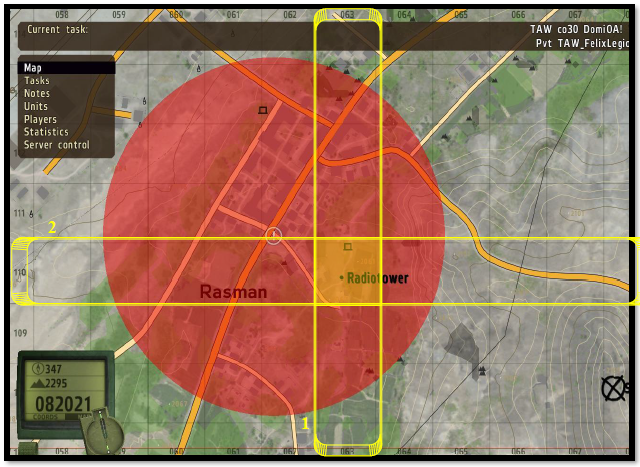 For example, the radiotower lies at (063, 110) and is about 450m from the marker. TIP: To remember the correct order to refer coordinates, think about getting it right and using what is left. Read the grid numbers to the right across the bottom, then up the left side. The coordinate system is definitive but not very quick or efficient. Therefore it is our recommendation that the system shouldn’t be relied upon for continuous navigation. Coordinates may best serve as areas to guide artillary or CAS on a target, but the time it may take for your listener to translate 6 numbers to a position on the map can be done faster using markers. Markers can be placed on the map by double-clicking and can have any text input beside it. During this text input mode, you can use the <UP> and <DOWN> arrow keys to cycle through all available marker shapes. Holding <SHIFT+UP / DOWN> changes the color. Choose the shape and color that’s most appropriate for the marker or in line with the standards set by your team. When a target is in an obscure medium or long-range direction, the compass is your best choice. Activated by the default key <K> and 2x <K> to toggle, it has 360 degrees to provide an immediate bearing to your teammates. In order to effectively plan a mission where you’re going to be traveling along waypoints or inserting into an objective, you must understand how to read the symbols and terrain features on a map. There is much more to map reading than simply the shapes and colors that first stand out. 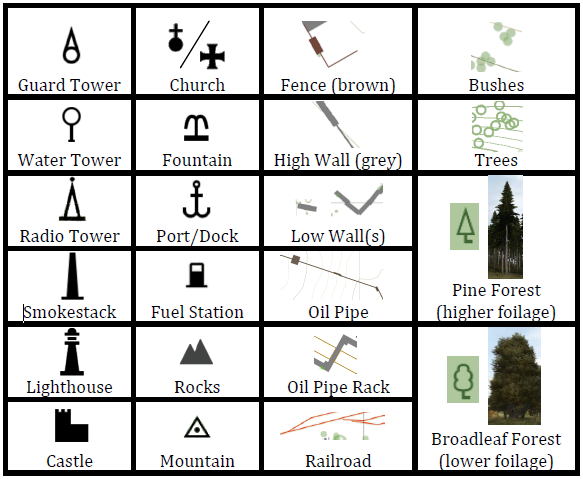 Below are tables with symbols and terrain features as they look in Arma 2. Study these to make the most of your traveling, angle of approach, and efficient comms when describing areas on the map.